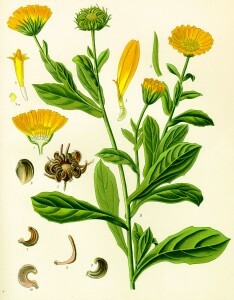 Calendula officinalis, also known as the humble marigold. The Greeks, Romans, Arabs, and Indians have been using it for centuries. It can be used to flavour and colour broths, vegetable dishes, salads, custard and baked goods as well as dye fabrics and cosmetics. Its golden edible flowers smell of honey, spice with a woody undertone. The birth flower of October, this wonder plant is talked about by many herbalists as the ‘mother of the skin' due to its excellent skin healing properties. In ointment form it can be used as an antiseptic, antibacterial, antifungal, antiviral and to reduce inflammation. It soothes irritated tissue and controls bleeding. Nappy rash, sunburn, eczema, athlete's foot, herpes, chicken pox, ulcers, shingles and grazes are all within the healing range of calendula. Bitter elements within the plant are good for stimulating the liver, helping it to eliminate toxins from the body and keep the skin looking great. Tea made from calendula flowers is also good for soothing gum disease. Essentially this wonder plant reduces pain and helps the skin heal faster. Essential Care make a terrific calendula balm for healing ailments. There's no wonder this special plant was named the 2008 Herb of the Year by the International Herb Association.